TRIOLOGY® Brushing Gel is the perfect alternative to traditional toothpaste. Most toothpaste just kill bacteria but TRIOLOGY®'s all natural, gluten free formula effectively disrupts biofilm while protecting the body's healing cells (fibroblasts). Plus the delivery of 20+ antioxidants with no harmful side effects allows TRIOLOGY® to completely RESTORE your oral environment to a healthy state! Safe for everyone, including children! Chemical-Free. TRIOLOGY® Brushing Gel can be a daily solution for many oral-care needs including: routine maintenance, periodontal therapy, & even post surgical healing! 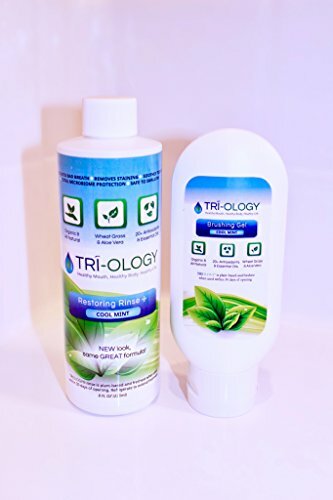 TRIOLOGY® Brushing Gel Is Great For anyone seeking a healthier approach to daily oral care, those who need an effective treatment of periodontal disease (including gingivitis, mouth sores & associated pain), consumer looking for a safe and lasting improvement of chronic bad breath (halitosis), sufferers of dry mouth, including conditions caused by medicines, health conditions and environment. TRIOLOGY® Restoring Rinse is the perfect alternative to traditional oral rinses and mouthwash. The all natural, gluten free formula boasts highly effective antimicrobial results while protecting the body's healing cells (fibroblasts). The result is the delivery of 20+ antioxidants with no harmful side effects. Safe for everyone, including children, and chemical-free, the TRIOLOGY® Restoring Rinse can be a daily use solution (2x/day), or as often as needed, in any consumer's oral care arsenal. This Rinse is great for: anyone seeking a healthier approach to daily oral care, those who need an effective treatment of periodontal disease (including gingivitis, mouth sores & associated pain), consumer looking for a safe and lasting improvement of chronic bad breath (halitosis), sufferers of dry mouth, including conditions caused by medicines, health conditions and environment. If you have any questions about this product by TRIOLOGY, contact us by completing and submitting the form below. If you are looking for a specif part number, please include it with your message. Oxyfresh Mouthwash Patented Zinc Formula with Oxygene – No Artificial Colors, Alcohol-Free – 16 Oz.